We’re back from our summer holiday – hot throughout Europe but, alas, as so often in England, summer’s lease hath all too short a date, and so it was this year. Nevertheless, the list of outdoor performances of Shakespeare’s plays is long and it grows longer every year. From The Globe on the Thames, to the Tea Lawn of Lauderdale House in suburban Hornsey, where tourists never penetrate, Shakespeare’s characters have enjoyed a great deal of summer basking in London. You could have gone to Regent’s Park to see The Winter’s Tale, or you could have attended a free performance of Hamlet at Canary Warf in a park surrounded by glass fronted skyscrapers that form a modernistic backdrop to the Elizabethan dramas. Or you could have gone to see The Comedy of Errors in Coram’s Fields near Russell Square in the very heart of London. The Kensington Roof Gardens used only the stars as the setting for their Romeo and Juliet. But there are also many famous, outdoor Shakespeare festivals beyond London. There are annual performances in both of the university cities of Oxford and Cambridge. The Royal Shakespeare Company stages performances in Stratford, on the banks of the Avon beside Shakespeare’s burial place, the Trinity Church. The Dell, as it’s called, hosts student and other amateur groups and this year they came from all around the world and offered The Tempest, The Merry Wives of Windsor, Much Ado About Nothing, As You Like It, Romeo and Juliet, Macbeth, Coriolanus, A Midsummer’s Night Dream, Measure for Measure, Pericles, Cymbeline and Henry IV Part 1. 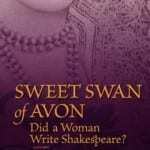 Towns across England enjoy Shakespeare in one of their parks or the gardens of their stately homes. They are usually staged by amateur groups but some towns, like Stamford in Lincolnshire, have performances staged by professional companies. Shakespeare haunts America’s summers, too, with festivals, both metropolitan and local. The most famous and popular outdoor venue in New York is the Delacorte where Shakespeare in the Park stages first rate productions, but there are many other venues such as, Carroll Gardens in Riverside Park, on Rooseveld Island and in numerous other places in all five boroughs. 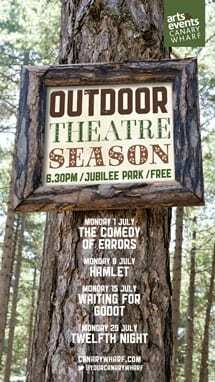 Wherever you are in an English or American summer you are within easy reach of an outdoor production of one of Shakespeare’s plays! 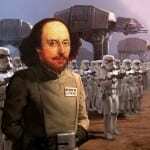 Shakespeare, Star Wars & Iambic Pentameter Shakespeare…A Woman?